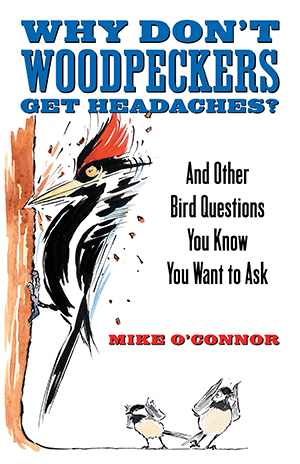 Beacon Press: Why Don't Woodpeckers Get Headaches? In 1983, Mike O’Connor opened the Bird Watcher’s General Store on Cape Cod, which might well have been the first store devoted solely to birding in the United States. Since that time he has answered thousands of questions about birds, both at his store and while walking down the aisles of the supermarket. The questions have ranged from inquiries about individual species (“Are flamingos really real?“) to what and when to feed birds (“Should I bring in my feeders for the summer?“) to the down-and-dirty specifics of backyard birding (“Why are the birds dropping poop in my pool?“). Answering the questions has been easy; keeping a straight face has been hard. Why Don’t Woodpeckers Get Headaches? is the solution for the beginning birder who already has a book that explains the slight variation between Common Ground-Doves and Ruddy Ground-Doves but who is really much more interested in why birds sing at 4:30 A.M. instead of 7:00 A.M., or whether it’s okay to feed bread to birds, or how birds rediscover your feeders so quickly when you’ve just filled them after a long vacation. Or, for that matter, whether flamingos are really real. Click here to read an article in Film Placement that features Mike O'Connor's involvement in the upcoming film "The Big Year"